Inlays and onlays are dental restorations that are indicated for premolars and molars showing a moderate level of decay and structural breakdown. The back teeth have pointed or rounded projections on the chewing surfaces called the cusps. 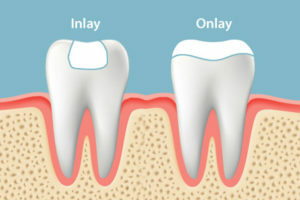 When one or more cusps are weakened by decay or fracture, an onlay can be used to restore their shape, strengthen the tooth, and prevent future damage. An inlay is used to restore a tooth when there is no cuspal involvement but the area of decay is large enough to compromise tooth structure. Inlays and onlays are fabricated outside the mouth, in a dental lab, and are made of gold alloys, porcelain, or composite. These restorations typically take two appointments to complete.